Your cache archive contains a multitude of pages after some time. How do you find the required information in this? As entry points bookmarks are suitable. You could use your bookmark collection only online till now. With the WebAssistant you can use these also for your cache archive. However, have you put sufficient bookmarks? No, you don't. Perhaps you still remember approximately the name of the domain. 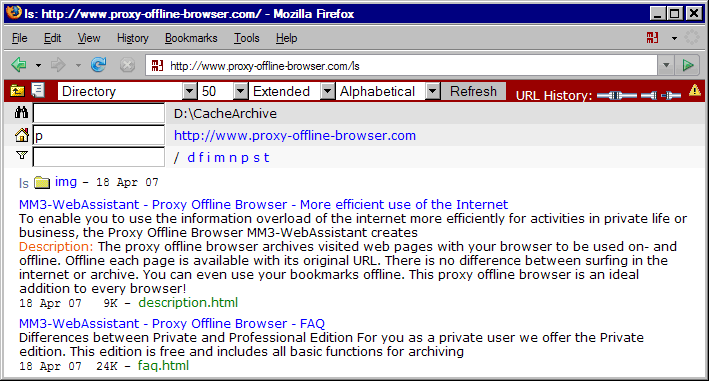 Like a File Explorer you can navigate through your cache archive with the browser now. You can in addition search your cache archive for sting words. The found results are represented in hitlist in the browser. To navigation you enter into the address bar of your browser: http://l.s. Usually suffices is ls. All domains of the enabled archives are displayed as a list in the browser. 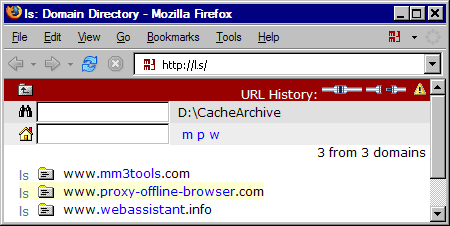 The picture shows a cache archive with three domains. If you click on the folder symbol or the name of the domain, then the respective home page is displayed (if this is available in the archive). If you click on ls, then the next deeper directory is displayed. Make sure that to this the string /ls is appended to the URL. Command ls and the meaning of the symbols are described at Navigation.